Could still happen. We shd. pray for him. He needs a few extra guardian angels, maybe. I wondered, since they did it so publicly, if the Church wasn't preparing another martyr; he had death threats before this. Better than praying, we should hope another neocon isn't let loose to start more wars. Pope Benedict XVI celebrated a memorial mass for Archbishop Rahho last week. He said then, ""Let his example support all Iraqis of good will -- Christians and Muslims -- to work for a peaceful coexistence, founded on human brotherhood and reciprocal respect . . ."
Surely that is the way Archbishop Rahho would have wanted his death to be commemorated, by increased Christian-Muslim understanding. The press says there was applause. There is certainly applause from me. The Catholic Church was among the few major institutions in the world to come forthrightly out against the Iraq War on principle. There were about 800,000 Christians in Iraq in 2002, and it is widely thought that about half have been forced to flee the country, mainly to Syria and Lebanon. Russ can never get on a thread, it seems, without talking about the Iraq war. Liberals are like that. As for martyrdom, I saw a quotation that made it clear the man is prepared for that. I think he has a lot to teach people in Rome--Christians and non-Christians--on several topics. I hope they listen. It seems to me Rome is pretty shrewd in their relations with other religions. At times they come off as a bit too conciliatory for my taste but then the Pope goes and baptizes a Muslim convert on Easter! No mixed messages there in that act. I'll be praying for Allam and Benedict; they'll probably both get some (more) death threats out of this. I believe they need to be in order to help the state of the persecuted Christians in those regions. It is only through such diplomatic efforts that Christians in those regions survive. If not, their extinction is assured. Personally, the last thing I would want is these Christians, who many are descendants of the earliest Christians from the Days of Paul, to become extinct -- especially in regions that were originally Christian then. I concur, Lydia. Seems like he's ready. 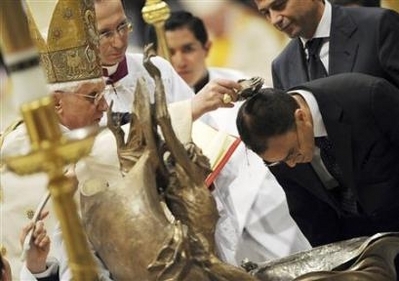 but then the Pope goes and baptizes a Muslim convert on Easter! No mixed messages there in that act. I especially liked the quote: "We no longer stand alongside or in opposition to one another," Benedict said. "Thus faith is a force for peace and reconciliation in the world: distances between people are overcome, in the Lord we have become close." Faith is a force for peace and reconciliation in the world, not because Mohammedanism and Christianity are compatible, not that Mohammedanism is valid, but because this man converted to the ONE TRUE FAITH and was reconciled to God. Aristocles, I know that's the common wisdom. I'm not sure that the common wisdom is correct, even strategically, much less in terms of keeping a clear sight of the truth. A dhimmi attitude isn't even always the best way to survive, and saying "don't rock the boat" to oneself and one's fellow Christians for generations warps the judgement on a variety of issues. In England the only one in the Church of England who is speaking loudly and clearly about the dangers of the Muslim gangs and the no-go zones is a bishop from those regions. This particular convert in the story in the main post (a guy who wrote a book called _Vive Israel_, of all things) certainly doesn't seem to believe that he is morally obligated not to say unplesant truths loudly about Islam because he will, if he does, be responsible for the extinction of his fellow Christians in the Middle East. To see what the alternative "strategy" looks like, consider that some of the comments that have coming out of Hamas-dominated Gaza from Catholics verge on disgusting--"Oh, no, Hamas is no problem" and so forth. The whole world is being misled about Muslim persecution of Christians in Gaza and the West Bank and the real cause of the disappearance of Christians from those regions, because the Christians themselves will not speak honestly to the press about it. We need more people like this guy.